Gunung Raya Express is a famous bus company based in Malacca. 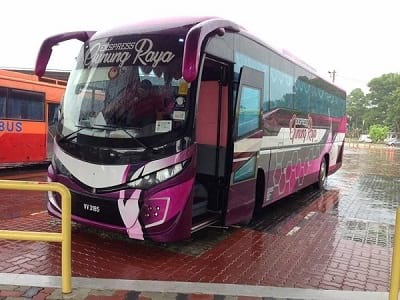 Gunung Raya Express is well-known in providing reliable and comfortable bus service to passengers within Peninsular Malaysia. The popular bus route provided by Gunung Raya Express is bus from Johor Bahru to KLIA or KLIA 2. The pick up points in Johor Bahru are located either at Tun Aminah Bus Terminal or Larkin Bus Terminal. The drop off points are located either at KLIA or KLIA 2, depending on your selection of drop off point. Gunung Raya Express buses are all well-maintained and the drivers are well-trained to ensure the safety of the passengers during the journey. Please Note: Changes to fares and time schedules are at the discretion of the bus/coach operators.